Still Pursuing Portraits is coming back July 16th for an ENCORE PERFORMANCE! I’ve been asked by many to please re-run last years brand new class so here it is-ONE LAST TIME! Yes I am Still Pursuing Portraits and I know so many of you are on this same journey. Or maybe you want to be but have been a little afraid to get started? Or you have started but your kind of stuck as to how to move forward, maybe on to side and 3/4 view portraits? Whether you’re just beginning a journey into drawing faces or you’ve been doing so for a bit and want to venture into more realistic looking faces, this class will give you the tools, yes TOOLS to help further you in your own journey. This isn’t about having look-alike faces, it’s about learning how to map faces and then manipulating those maps to your own liking so you can practice drawing with a bent towards developing your own signature look. That’s what most artists strive for, their own look. While the basic ‘rules’ of drawing faces can be a bit confusing to remember, especially when you get into side and 3/4 view portraits, I’ve developed an easy to remember way to draw portraits from your imagination. Once you get some practice in, it’s easy to draw a quick face map and sketch a portrait without looking at anything because you’ve learned where everything is supposed to go on the face and how you can tweak things to put your own look on it. I’ve invited some of my previous students from last year to participate in a blog hop showcasing their work, before, during and since class. Their growth has been amazing to watch and this particular group had so much fun together in class that they formed their own Facebook group to continue supporting each other! So don’t delay, don’t miss out!!! This is the last time I’m offering this online workshop!!!! Pam, Not only do I love your work but I am so impressed by your teaching methods and organizational skills! As a retired teacher of gifted teens, I can recognize whole brain brilliance. I never got to finish the Pursuing Portraits on line before the deadline….but I am enjoying your new book on my own. Just finished making my journal last night. Ready to continue. I’d love to do more with “Portraits”, hoping to win! Thanks for sharing your many gifts. Would LOVE this!!! FIngers crossed! Have been for a long while very much inspired by your work and winning a place for your portrait workshop would certainly be a dream come true. Thx for the chance to enter. Would love to join in the fun! 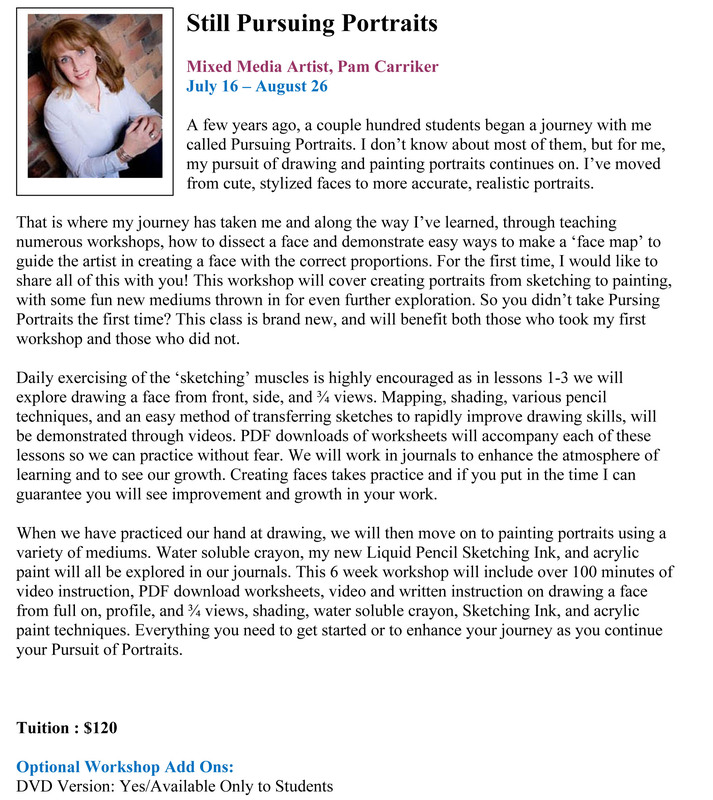 Hi Pam, I would love to have the opportunity to win your Portrait class! I have seen that many of my friends have taken your classes and have grown so much. I have been in a slump lately and could use a boost in my art! Hope your having a wonderful summer. I love your work! I need to learn so much!!!! I would love to be able to take your class. Since I live in Hawaii. there are no teacher that can teach like you. I would love to win a spot on “Pursuing Portraits”. Can’t find where to enter for the giveaway! Love love love your work! I was here to win – Lesley sent me (LOL). But, I read that I will have to come back on the 7th. Is that right? It was so neat to see the blog of the faces that I had admired for a long time. Looks like amazing work. I’m here to enter to win Lesley Riley’s TAP class. The last one! Wow, I am really fortunate to be able to participate in it!